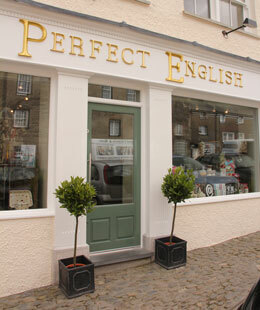 Perfect English is a very stylish independent shop in the heart of the beautiful Lakeland village of Cartmel. The owner, Donna English, has sourced an eclectic mixture of designer-led high end gifts. A great deal of time and thought has gone into her choices which include exquisite ceramics, unusual jewellery, home furnishings, and luxurious toiletries. Housed in a lovingly restored historic property in the village square, the Perfect English shop is furnished with pieces of classic country furniture and antiques, all of which are also for sale.